Nick Diaz, the longtime MMA fighter who fought Georges St-Pierre for the UFC welterweight championship in 2013, got his five-year suspension reduced to 18 months, which means he can fight again in August 2016. 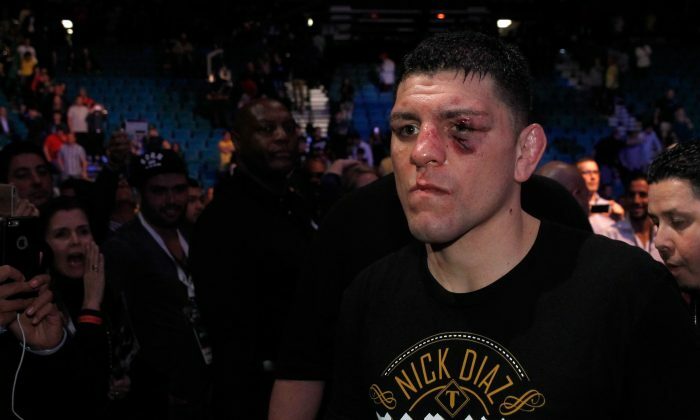 Fox Sports reported that the Nevada State Athletic Commission approved a settlement for Diaz, who allegedly tested positive for marijuana after his last fight against Anderson Silva in January 2015. The commission brought up Diaz’s settlement agreement and gave it a quick unanimous vote, but it didn’t reveal the details of the matter, Fox Sports noted. It means that Diaz can fight next on August 1, 2016. His fine was reduced from $165,000 down to $100,000. He has to pay the fine before his next fight or on Dec. 1, the commission ruled. “We cannot comment now because it is still an ongoing matter,” Nevada commission officials told Fox Sports on Tuesday. When Diaz was handed his 5-year suspension in 2015, it was denounced by fans, fellow fighters, celebrities, and even politicians, who said it was excessive. A White House signature to get the suspension overturned garnered more than 100,000 signatures. “With respect that Nick will be able to fight again beginning Aug. 1, I’m pleased with the outcome of the settlement,” Hunter Campbell, who is a managing partner at Campbell and Williams–the law firm Diaz used as legal counsel–told MMAJunkie. During his first hearing, Diaz’s lead counsel Lucas Middlebrook claimed Diaz had actually passed two tests on fight night, and the one he failed came from a lab that wasn’t accredited by the World Anti-Doping Agency, or WADA, according to MMAFighting.